The essential ingredient of snuff is powdered tobacco. A pinch of snuff is held to the nose and sharply inhaled. 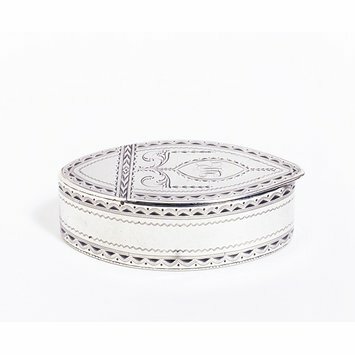 Throughout the 18th century the snuff box was a fashionable accessory for the well-dressed man, a partner to his sword, his watch and his buckles. Boxes were made of many materials, ranging from horn and tortoiseshell to porcelain, silver and gold. James Kennedy, boxmaker, was apprenticed in Dublin in 1761, and worked in the same city at 17 Exchange Street from 1784 to 1801. He died in 1803. Bright-cutting is a distinctive technique which was particularly popular in the late 18th and early 19th centuries. An engraving tool is used to gouge out a large chunk of metal, which, when clean, flashes the light back at the viewer. When the cuts are tarnished, the contrast between the blackness of the cuts and the clean silver is no less effective. 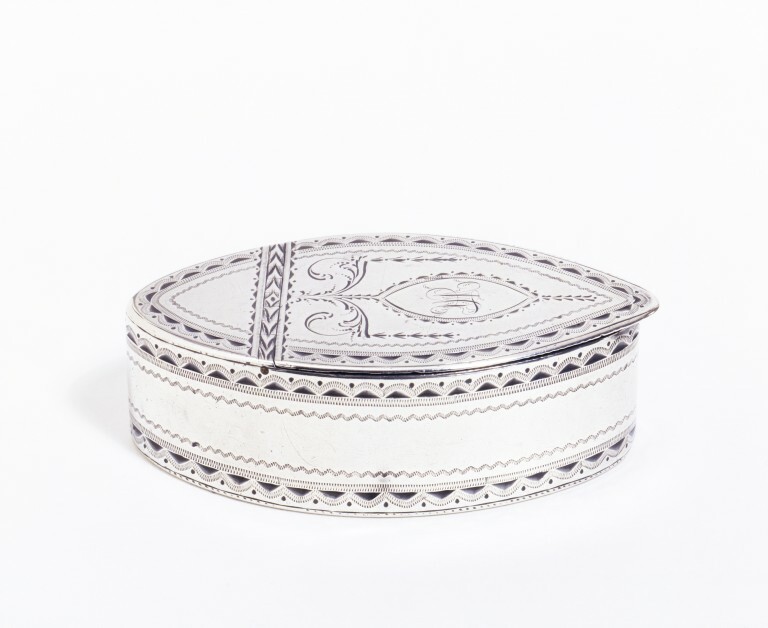 On this box the semi-oval cuts are placed in an oval pattern to echo the shape of the box. Much use is also made on this box of wrigglework - made by twisting an engraving tool from side to side as it is pushed forward. The wrigglework follows the bright-cutting and creates undulating lines around the side of the box.